Stage 4 breast cancer often gets swept under the rug in the sea of pink awareness campaigns. (I've talked about my frustration here and here and here, and what might help here.) 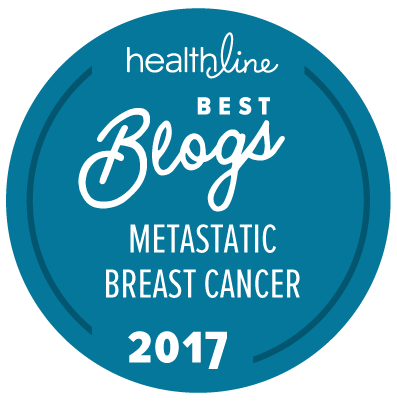 It is a tough fact to face that thirty percent of breast cancer cases will someday metastasize, that metastatic breast cancer is not yet curable, that breast cancer -- despite the advances in detection and five-year survival rates (which don't mean a whole lot) -- takes 40,000 lives in the U.S. every year. None of this is good news. None of it is wrapped in a pretty pink ribbon of survivorship or triumph or convenience from a marketing perspective. METAvivor is one of the few organizations dedicated solely to funding research for Stage 4 breast cancer. It's estimated that research for Stage 4/metastatic breast cancer accounts for only about 3% of the overall funding for breast cancer research. METAvivor is looking to change that. In 2012, METAvivor launched its Elephant in the Pink Room campaign to attempt to bring more awareness to Stage 4 cases. A few weeks ago, Kohl's Department stores and Komen partnered up and launched a Pink Elephant in the Room campaign urging customers to shop to raise money for Komen. No word about Stage 4, no nod to METAvivor, just another commercialization of this terrible disease, apparently using lifted slogans and ideas. Despite many attempts by METAvivor to reach out to both Kohl's and Komen requesting they halt their Pink Elephant campaign, the only response they've received is a promise by Kohl's to add some language about Stage 4 (which they have now done). METAvivor is seeking legal opinions as it considers its options to force Kohl's/Komen to take down their campaign. I am a lawyer, but copyright is not my area of expertise. Without referencing some really old textbooks of mine, I don't know if what Kohl's and Komen have done is illegal, but I know it leaves a pit in my stomach. It feels wrong and shady, not to mention -- really? Another "shop pink" drive? I'm not the only one disheartened by this latest launch on behalf of "awareness." Tell me, what do you think?